If you are a jewel junkie like we are, 2014 is your year. Copeland Jewelers is sharing with their customers a promotion of a year to give to local charities. The esteemed Austin jeweler is showcasing a prominent Texan each month, in a shot donated by a top photographer, wearing their Copeland jewelry in support of their chosen charity. This opportunity is the brainchild of Clay and Debra Copeland and their team. We all know that since 1983, Copeland Jewelers has expertly curated vintage, estate, and consignment collections and the finest custom work and repair. Copeland Jewelers finds inspiration through nature and the rocking music scene. Their handmade custom guitar picks are a must- shout out to all music fans, too. The VIP’s and charities for the remainder of 2014 have been chosen, with one male, “Mr. December” being revealed in late fall. 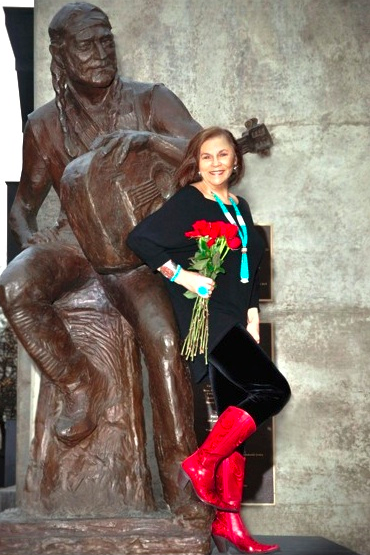 For February, Mary Lockwood Crouch, has on her Valentine’s Day-inspired red boots atop the Willie Nelson statue downtown. She wears a pre-1970s Santo Domingo heishi necklace from Copeland Jewelers’ vintage collection in support of Communities in Schools and the photography is by Andrea Turner. In January, the VIP was Van Irene for St. Jude’s Research Hospital wearing Spark Creations, shot by her bubby Greer Evans. Her steller one of-a-kind orange spessartite garnet and diamond collar necklace and matching earrings with stones selected and set by Clay Copeland is one of our favorites. Spark Creations are known for their unique, one-of-a-kind pieces. The collar necklace and earrings are in 18K white and yellow gold. The collar has 39.75 cts spessartite garnets and 7.15 cts diamonds. Clay Copeland selected and set the garnets for the earrings which are 14K white gold with .5 cts diamonds.